As most regular readers of The Book Habit already know, I’m someone who needs to be constantly learning. I have always thrived as a student, whether in an official capacity or through picking up knowledge in my spare time. It’s probably why I ended up following my academic career to its natural peak as a PhD student and ultimately decided to leave when I realised that it wasn’t quite what I thought it would be. Even my hobbies tend to be dictated by the space that they provide to pick up new skills. I took up sewing a couple of years ago and have worked hard to acquire knowledge as much as I can – from online courses to a whole separate sewing blog (you can find me at Sew for Victory, if you’re craftily inclined), it’s given me an entirely new area for skill acquisition. With my reading habit, I’m similarly attentive to any opportunities to learn. I’ve always been someone who digs up all available resources on authors and books. I just love absorbing information that broadens my experience. Since leaving the PhD, I’ve also had much more time on my hands. I’ve filled it, in large part, with lots of free literature courses. The internet is an incredible resource for those of us who are constantly seeking to learn more. From my very extensive experience of combing the web for free courses and lectures, I thought it might be useful to compile a list of my favourites. These resources are all free and well-curated, so you can be sure that the information is high quality! I love Future Learn. I’ve taken a truly astounding number of their free courses and have yet to be disappointed by the breadth and quality of anything to which I’ve given time. Not only is there a truly incredible number of courses on offer, the pre-enrollment information gives a clear indication of the general time commitment. Courses offer a variety of written information, video lectures, and assignments. Assignments are given feedback by other students and you also have the option of providing feedback of your own. It’s a great opportunity to gauge your own understanding of the material and interact with others! That said, courses do vary in their format. Assignments aren’t a part of every course. Some will have set readings that may amount to full books or extracts that are provided by the course creators. This information is usually presented very clearly at the start of the course, so you will have time to get to the library and understand the sort of time commitment expected. It’s important to bear in mind that, unlike other e-learning websites, Future Learn courses are not available on archive. So courses are released and run for set periods of time, during which you have the chance to enroll and participate. Once you’re enrolled, you have a set period for course completion. It’s a good idea to look over the calendar of upcoming courses – you can enroll in advance and make a note in your diary of when the course content will be released. I’ve taken many excellent courses via Future Learn that tend to be available on an annual basis. The calendar of courses changes constantly so it is definitely worth keeping an eye on the future course selection! As always, courses are free. However, you have the option of paying a set fee to ‘upgrade’. Upgrading gives you unrestricted access to the content (so that you have it forever, rather than having to complete within a set period of time) and a certificate of completion to prove that you’ve taken the course! edX is an amazing resource for incredibly high-quality courses. Available from the likes of Harvard and Darmouth, you are truly learning from some of the world’s best institutions. One great advantage that edX has over Future Learn is its archived courses. You have the option of participating while courses are ‘live’, in which case you have access to current assignments, feedback, and the ability to interact with other students. However, once the ‘live’ period is over, courses are archived for enrollment at any future points. This means that there are far more options available to interested students, albeit with less interactivity. As with Future Learn, courses are provided in a variety of formats – written information, video lectures, and assignments. There is typically required reading, some of which is given in extracts as part of the course. For courses focussed on older literature, links will often be provided to open access sources online so you won’t need to worry about hunting out novels from the library or bookshop! I’ve been so impressed with the courses that I’ve taken via edX. They tend to be more challenging and demanding than those available via Future Learn, but I’ve found that they also provide a much deeper insight. If you’re looking for courses more akin to what you would expect from a university-level literature course, edX is definitely the place for you! As with Future Learn, courses are available for free. However, you can ‘upgrade’ for a fee that will provide you with a certificate of completion at the end of the course! This upgrade is only available for ‘live’ courses. Some courses are also available in other languages. So if you prefer to learn in French, Spanish, or otherwise, there’s a good chance that you will find a course that suits you! In this case, you can go direct to the horse’s mouth for a variety of Yale’s most interesting literature lectures and courses. These courses include videos of lectures delivered to Yale classes, so you have access to the Yale courses exactly as they are given at the university. It is undeniable that these courses lack the fullness of those provided by Future Learn and edX. They are, after all, courses that were designed to be taken as a student at the university. However, the courses available via Open Yale Courses come with a syllabus (detailing course content more broadly, as well as reading material) and the course’s video library. It’s really everything you need if your goal is simply to learn. Of course, the format of these courses means that you will not have access to assignments, feedback, or interaction with other students. Unlike Future Learn and edX, you do not ‘enroll’ in these courses. They’re simply available via the online library for you to work through at your own pace and whenever you choose. I find this hugely appealing because it’s truly devoid of any pressure. It’s a great way to fill in the blanks regarding any particular literature-based knowledge, as well as to potentially accompany some new reading adventures with authors that you haven’t previously read. When it comes to literature courses, the selection via Coursera is a little harder to navigate. They aren’t clearly contained under any particular discipline, so you have to dig a little bit in order to find some good courses (I’ve included links to some of my favourites below, however). As with Future Learn and edX, Coursera courses are provided by reputable institutions and are all incredibly high quality. They come with video lectures and written information, as well as a variety of assignments that may or may not be available depending on whether you are accessing the course for free. As with other e-learning platforms, you have the option of paying a fee to access the full course and receive a completion certificate at the end of the course. Coursera courses are more limited to those who choose to access them without paying a fee. Some courses are available for full via free 7-day trials, but most will give you free access to the course as an audit option. This means that you will be able to view most video lectures and written content but will not be able to actively participate by communicating with others or completing assignments. So just be aware when you sign up that taking the course for free will limit your experience. In my view, however, unless you are bowled over by personal interest or looking to complete a course for professional reasons, you will get plenty of information from free access. With Udemy, it is important to bear in mind that not all courses are created equal. Unlike edX and Future Learn courses, just about anyone can submit their own course content to Udemy. So not every literature course is going to be high quality, nor will they all have reputable educational institutions as their creators. Additionally, Udemy puts most of its courses – particularly those of higher quality – behind a payment wall. So keep in mind when browsing that much of what you come across will require upfront payment in order to access any of the course material. That said, Udemy also has an excellent review system for students to leave their opinions on courses. This is a great way to filter out the lower-quality content and ensure that you are getting what you want. You also have a preview video for a general overview of course content, prior to enrollment. It is certainly worth exploring what Udemy has to offer because there are some truly excellent courses, some of which are offered for free. So there we have it. 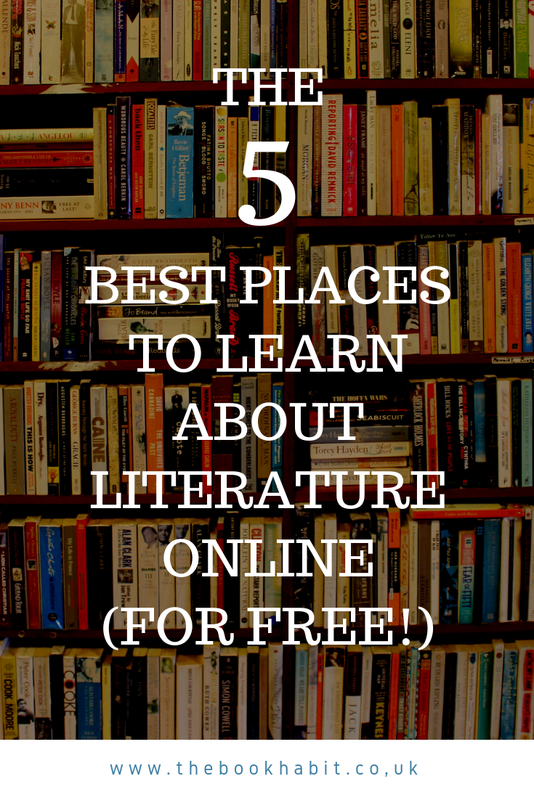 My favourite five sources of free literary learning online! If you have any of your own favourites to add, be sure to comment below and share your thoughts. Happy learning!